With FREE Digi-Max Controller! The Espar D2 will run over 20 hours on a single gallon of diesel fuel. On LOW HEAT, this little heater uses as little as 0.02 gallons per hour! The Espar Airtronic D2 bunk heater is a technological miracle! Operating over 20 hours on a single gallon of fuel and producing up to 7,500 btu of heat, the Espar Airtronic D2 eliminates the need of idling your truck engine for interior heat. Along with tremendous fuel savings accomplished by not idling the main truck engine, the use of an Espar also reduces engine wear associated with engine idling. Operating through four automatic heat ranges via a wall mounted thermostat and a very intelligent ECU (electronic control unit) the Airtronic D2 will keep you warm and comfortable in the most severe winter conditions. The Espar D2 Airtronic is without a doubt, the most economical, quiet and comfortable way to heat your truck, boat or RV. Its compact size allows for easy and simple installation in the tool or luggage compartment in most sleeper bunks. Backed by a full 2 year/2000 hour warranty, you can rest assured knowing you have purchased a high quality, dependable product. 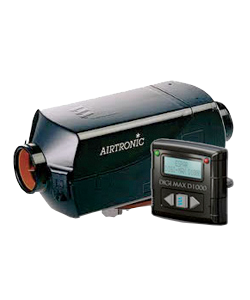 For bigger walk-in sleepers, you may want to consider the Airtronic D4. Concerned about potential idling fines? In many of our states there is legislation forbidding the idling of truck engines. No worries with an Espar, ALL of the Espar Airtronic heaters and most of our Hydronic Coolant heaters are CARB approved and EPA verified. What does this mean to you? It means the Espar owner is in total compliance in regards to their idle-reduction equipment selection.